Soapi.FindUser is a tiny .NET 3.5 application that searches all Stack Exchange sites for users by name with the provided search term. The results are grouped by site and are sortable by Name or Reputation. 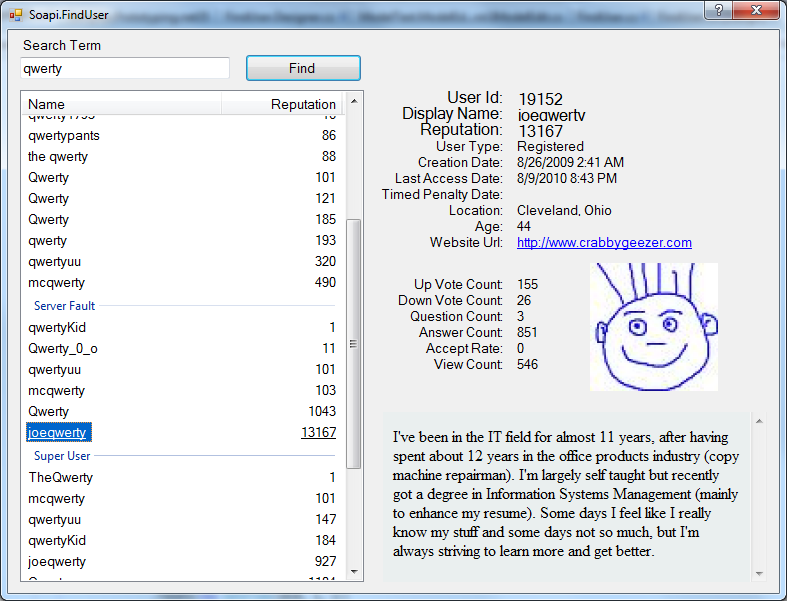 Hover or click an item to view the profile, double click an item to open your default browser to the users profile page. This application will run on any .NET 3.5sp1 compatible platform. Soapi.FindUser was written, in 30 minutes, to serve as a sample app for Soapi.CS. The source for Soapi.FindUser can be found in the answers and is included in the Soapi.CS source code. The primary purpose of Soapi.FindUser is to serve as a simple sample application for the Soapi.CS library. /// You can use this form as a selector in your app. Not the answer you're looking for? Browse other questions tagged app obsolete .net soapi.cs .